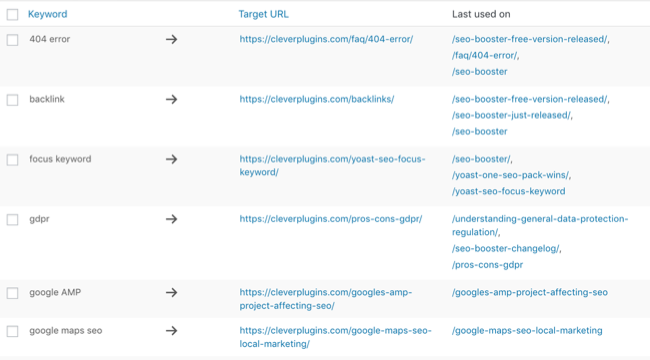 SEO Booster can convert keywords to internal links on your site automatically. This is extremely helpful for your visitors to navigate and extremely helpful with your internal SEO linking. On this page you can see the list of keywords and to where they are pointing. Keyword - The keyword or phrase you want to link to an URL. Target URL - The URL to link to, it can be an internal link or external, up to you. Last used on - The last three pages where the keyword was made into a link. Just for reference. It is really fast to add a new keyword, just enter the text and the URL. Keep in mind, the plugin does not let you enter the same keyword twice, but you can point as many words and phrases as you like to the same URL, all depending on your SEO strategy. However, this means sometimes it seems like links are not appearing where they should, or the links are still there even though you turned the links off. Usually, this is because you have a cache plugin running you need to clear its cache, or your website host has additional layers of caching. Please wait a few minutes.